Classic Vacuum System- Vacuum Pump - EVP Vacuum Solution! Vacuum system can be divided into low pressure vacuum system, high pressure vacuum system and ultra-high vacuum system according to the vacuum degree. Based on the properties of structural materials, it can be divided into glass system and metal system. According to the flow of gas in the system divided into static systems and dynamic systems. The low pressure vacuum system is refering to the ultimate vacuum pressure over 10-1 Pa ~ 10-5 Pa, such as the backing of high pressure vacuum system, the exhaust device of filament lamp, the exhaust device of vacuum flask refills, vacuum locker, etc. The system is generally used to pump air with rotary vane mechanical pump, and the vacuum gauge is measured by a low vacuum gauge. The ultimate vacuum of high pressure vacuum system between 10-3 Pa and 10-5 Pa, which were serial pumping air by the high pressure vacuum pump and the low pressure vacuum pump. Generally in the high pressure vacuum system, the high pressure vacuum pump normally use oil diffusion pump, turbo molecular pump and the low pressure’s use rotary mechanical pump. High pressure vacuum gauge use ionization vacuum gauge, low vacuum meter adopts thermal conductivity vacuum gauge. 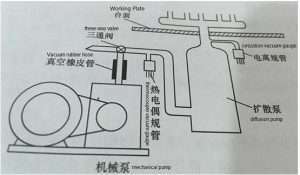 The below picture show the basic structure of vacuum system for glass diffusion pump high vacuum system. The vacuum rubber hose connected the mechanical pump and the three-way valve to avoid mechanical vibration of mechanical pump in its operation to transmit to the oil diffusion pump and the glass pipelines. During system operation, the three-way valve will be to the place which connected to the oil diffusion pump and the mechanical pump. When system stopping and oil diffusion pump stopping heating to close the mechanical pump. Please make sure the oil pump has already cooled and the three-way valve have to connect to the place which on the pipelines of the mechanical pump and the atmospheric. It is connected to the gas path of the mechanical pump and the air in the mechanical pump to prevent the return of the mechanical pump to the diffusion pump and the high vacuum parts. The high vacuum system of glass is better than smaller, which is suitable for scientific research and the preparation of small electro-vacuum devices.